A good hatchet should rank as a must-have on your list of camping equipment. 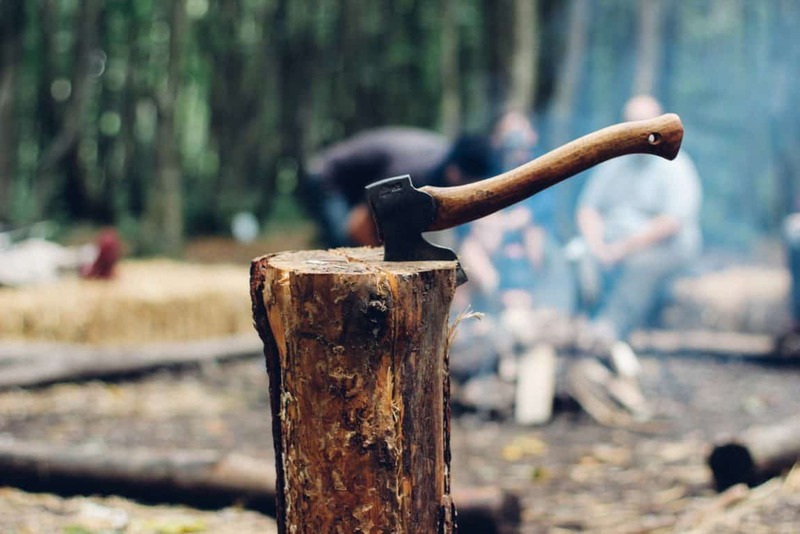 Hatchets — which perform the same function as an axe, but are smaller and more portable — are a versatile tool to have with you out in the woods. Use them to split firewood, or to clear brush and small trees. If you leave the sheath on the blade, hatchets can also act as a hammer to help drive tent stakes into the ground. 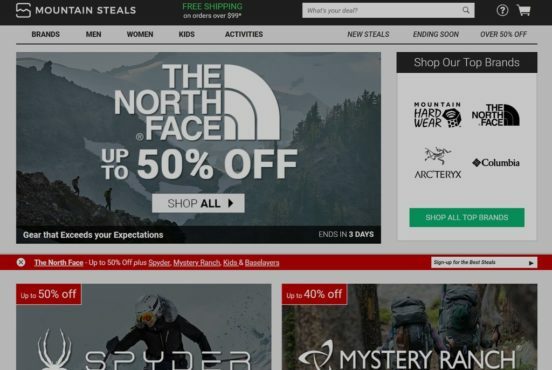 What do you need to look for in a camping hatchet? The longer and sharper a hatchet is, the safer it will function. Long hatchets are more likely to hit the ground than to hit your leg when swung downwards. And sharp hatchets versus hatchets with a dull blade cut better and are more predictable so you have more control. After you decide on a hatchet, store it in its sheath and be very careful using it around others. Consider also purchasing a sharpening stone. If your sheath is leather, you’ll want to oil that regularly as well. 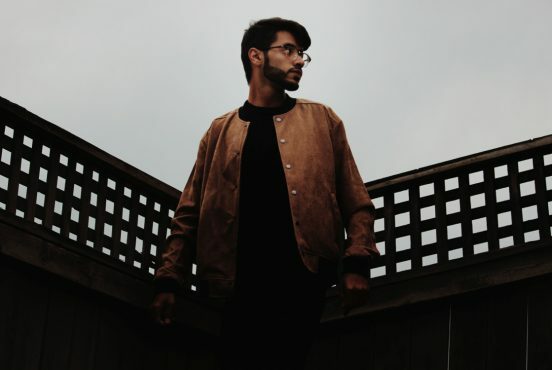 It can be hard to find a good quality hatchet, and more than that, it can be hard to find a good quality hatchet that’s a decent price. 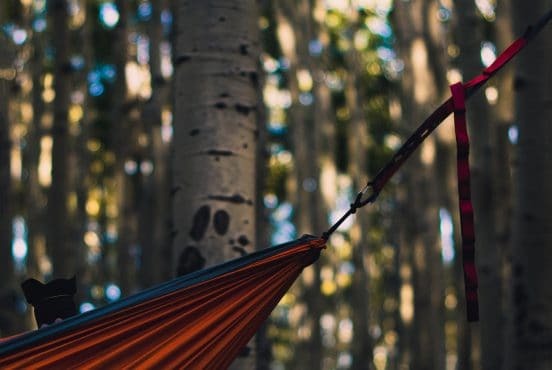 We’re here to help you find the cream of the crop, so here are a few of the best camping hatchets we’ve found on the market. Estwing Manufacturing Company makes tools such as hammers, axes, and pry bars with high-grade American steel in Rockford, Illinois. 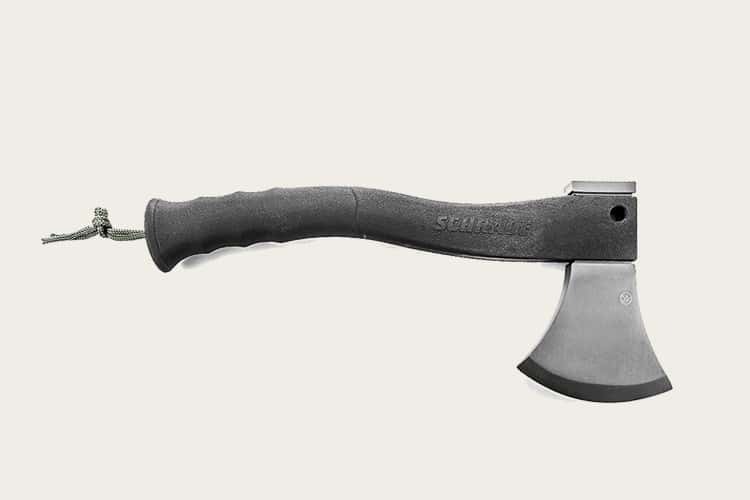 This 14” Camper’s Axe is made all in one piece, so it’s incredibly durable and built to last. A nylon sheath protects the cutting edge and the sheath can hook to your belt. The axe also includes a shock-reduction grip to reduce the impact vibration and help your hand stay a little more comfortable. Users report that this grip makes a big difference in ease and comfort of use. The axe even has a notch specifically made for pulling tent stakes. Estwing recommends that you use the axe to chop logs, small trees, or branches. It will also work well to split firewood and kindling. Keep in mind, though, the axe is a little heavy (two pounds) and might not be the best choice for backpacking. Silky Saws have been around since the early 20th century. The company makes wood cutting saws in Ono, Japan, home of only the highest-quality cutlery steel. 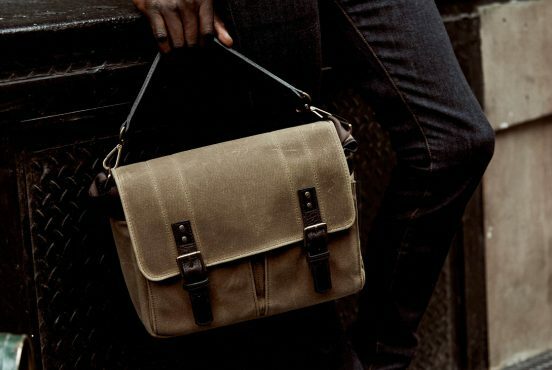 The 568-12 weighs 1.68 pounds and comes with a black sheath that’s made of nylon with an interior plastic liner (and a belt loop). 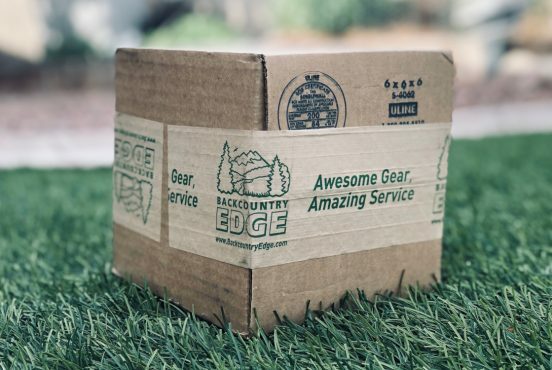 The aggressive Japanese blade easily cuts pine, hardwood, aspen, and just about any kind of tree — and best of all, it’s a little cheaper than comparable high-quality saws. As far as maintenance, the resharpening process is painless and easy. Hults Bruk, a Swedish company, makes a variety of different axes. 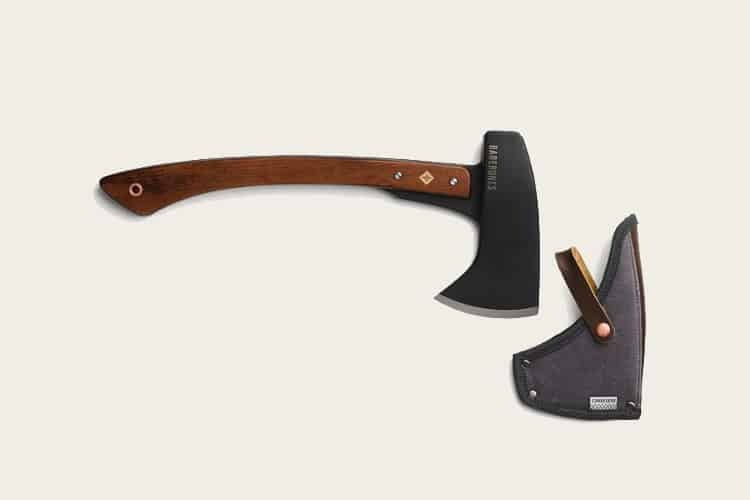 Like all of its axes, the Tarnaby hatchet is hand-forged from Swedish axe steel. 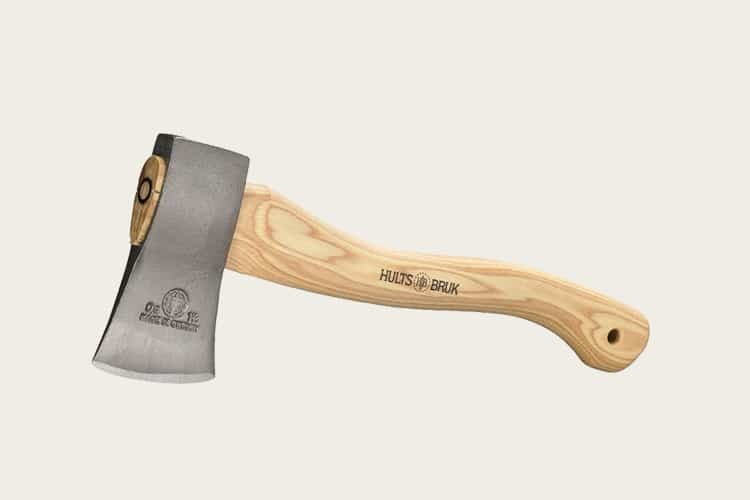 Hults Bruk says this hatchet works well for light clearing of brush, making kindling, or any work in the garden. 15 inches long and weighing in at 1.25 pounds, the axe touts a head made of clear-lacquered ironwork, while the curved shaft is crafted from hickory and the handle is treated with linseed oil. The head is extra durable — in production, it’s struck multiple times to increase its density. 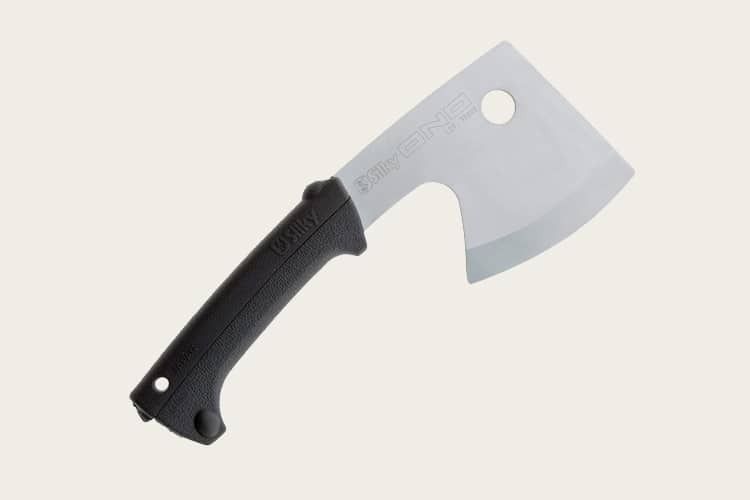 The Tarnaby hatchet has an additional design element that other camping hatchets might not include: the leather sheath that comes with each axe is decorated with Swedish elements. Schrade makes all kinds of blades, from machetes to spears to folding knives. The SCAXE2 is almost 12 inches long, with a four-inch titanium blade. The sheath hooks easily onto your belt so you can grab the axe any time you need it. The hatchet also has a black rubber grip that conforms to your hand so it won’t slip. Inside the shaft, you’ll find a ferro rod (a fire starter) with a lanyard, and the axe has a hammer pommel as well. The SCAXE2 is priced lower than similar options and offers some extra features to help you survive in the woods. Husqvarna is a Swedish company that manufactures a range of outdoor power tools: chainsaws, lawn mowers, tractors, leaf blowers, edgers, log splitters, and more. Its 13” wooden hatchet is simple compared to its other products, but extremely effective for a weekend camping trip. 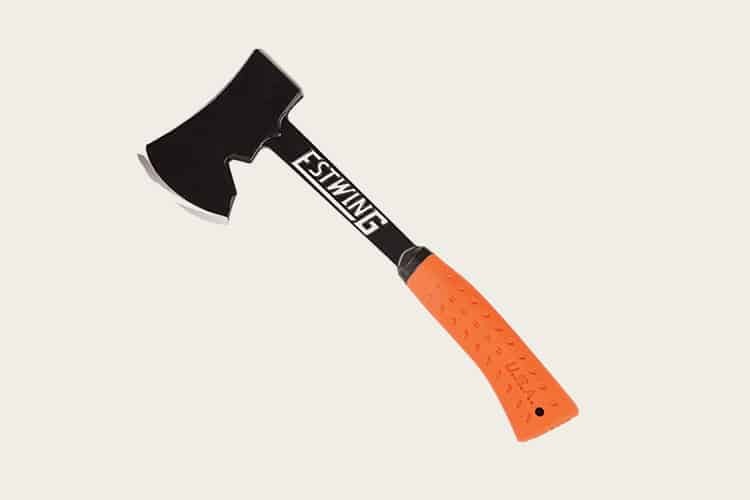 The hatchet is great for cutting branches or splitting wood. With its hickory shaft, the head is attached to the shaft with both a wooden and a steel wedge to make sure everything stays put. The hatchet also comes with a leather sheath for the blade. 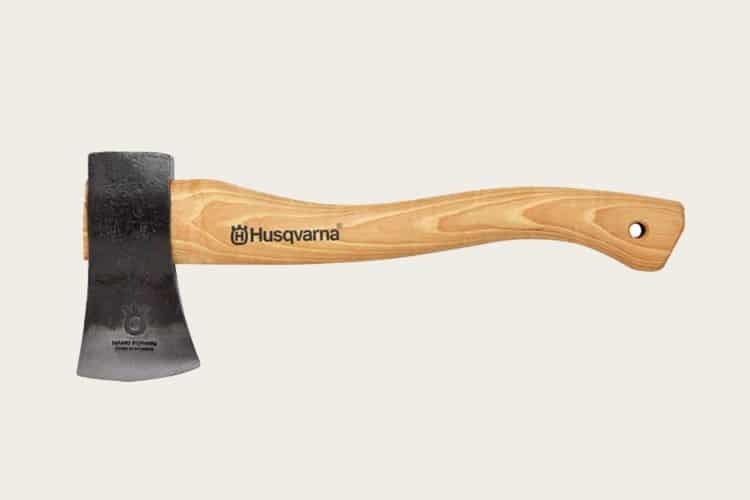 Husqvarna’s axes are forged in Sweden with Swedish axe steel. The company recommends greasing the axe to stave off rust and not storing the axe in warm conditions, as the handle could shrink. Barebones Hatchet is an impressive piece crafted with a 3.75 inch carbon steel blade. 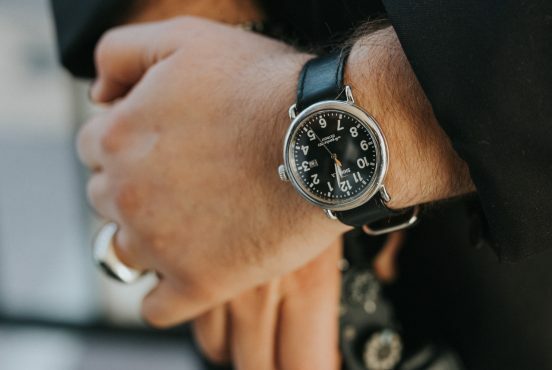 Weighing in at 4 pounds, the hickory wood handle offers a comfortable position for your hand. The hatchet’s compact design helps you maximize your swing by giving you the optimal weight and balance. 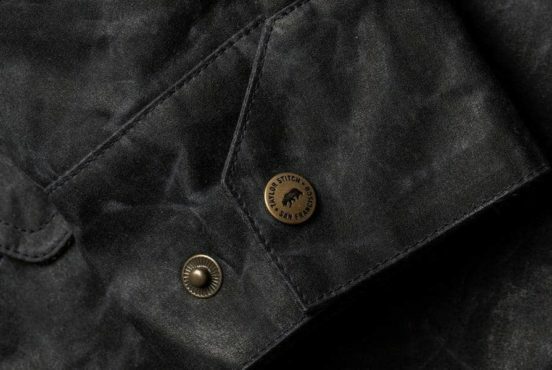 An overstrike guard helps the hickory handle stay fresh, and a waxed canvas sheath protects the blade too. The Gerber Pack Hatchet is a budget-priced but high-quality option for your next camping hatchet. With a green handle made of rubber overmold, this hatchet has finger grooves that are especially made to guide your swing and help you make precise cuts or do detailed work. 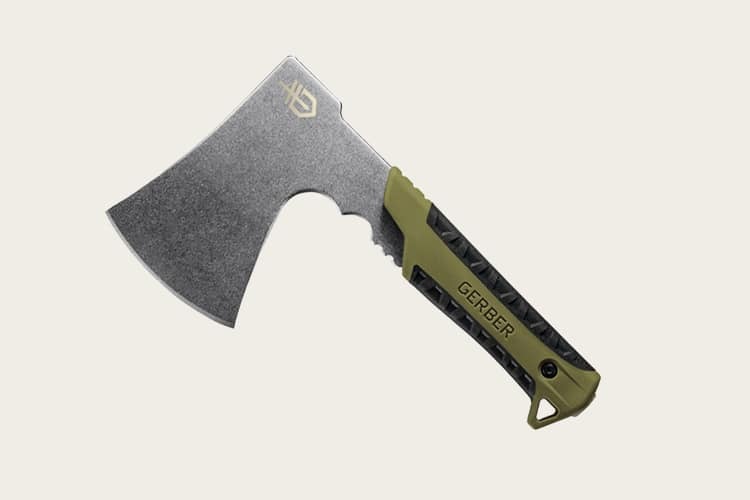 Coming in at one pound and nine ounces, the Gerber Pack Hatchet is lightweight and easy to lug around. The blade is made of durable stainless steel and the hatchet also includes a lanyard hole. After you get done chopping firewood, there’s a good chance you’ll be preparing a meal over the campfire. 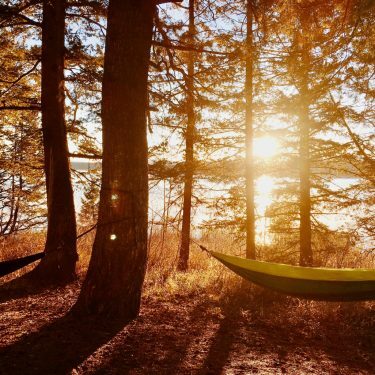 In that case, check out our guide to the best firewood for your next campfire feast. 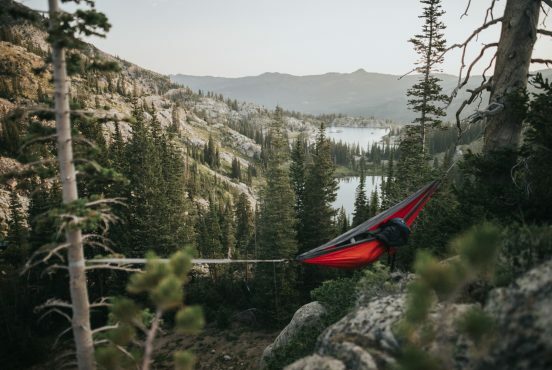 For more camping gear, check out our favorite hammock underquilts, budget hiking boots or the best camp shoes.